Inventory We are a resale marketplace, not a box office or venue. Ticket prices may exceed face value. This site is not owned by Masonic Temple Detroit . The Masonic Temple in Detroit is the largest of the Masonic Temples worldwide. Gothic Architecture at its best and on a grand scale is a rare find. The limestone facade is filled with meticulous details that shows the effort of the skilled artisans that designed and built this building in the 1920’s. Jack White from the White Stripes saved this building from foreclosure by footing a back tax bill in 2013 as retribution for helping his mother in a time of need when he was a child. With 1037 rooms and 4 ballroom and theater options the building is massive. Seating capacity for the Masonic Theatre is roughly 4600. The Killers performed there in January of 2018 but before that Teagan & Sara, LCD Soundsystem, and ASAP Mob will grace the iconic stage. TempleDetroit.com is not a primary vendor, supplier, or affiliated with any official website. We proudly provide access to a large supply and low prices online for all secondary market events. Ticket prices may be well below or above face value and will fluctuate with the market. 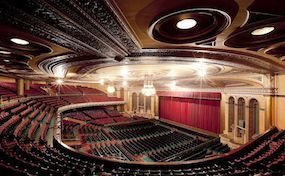 To purchase tickets for all Masonic Temple Detroit events simply click on the show of interest or call our operators at anytime.